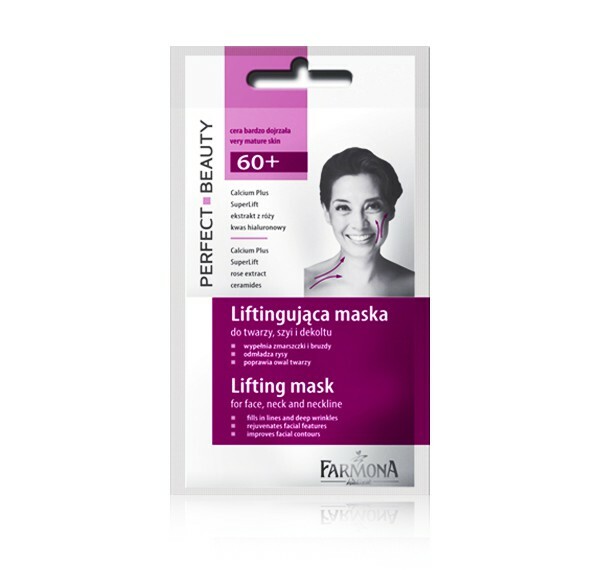 Lifting mask for the face, neck and neckline is a product developed for women over 60, whose skin is dried out, lacking firmness, with deep wrinkles and discolorations. How does the mask work? The rich formula of the mask through a combination of innovative biotechnology and extremely effective active ingredients – Calcium Plus, SuperLift, extract from wild rose, ceramides, rice oil, Shea butter – instantly tightens the skin and enhances facial contours as well as reduces lines and wrinkles, giving the skin a rejuvenated effect. In addition, it prevents redness and “spider veins” as well as lightens stains and discoloration, aligning skin tone. Provides immediate lifting effect – your skin instantly regains firmness and elasticity, wrinkles and furrows are immediately shallower and less visible. Facial features are younger, oval improved. The skin takes on a beautiful colour, spots and blemishes are less visible. Apply a thick layer of the mask on the face and neck, avoiding eyes and mouth area. Leave for about 15 minutes. Massage the excess of the mask into skin or remove with cotton pad. Apply regularly 1-2 times a week. Calcium Plus, SuperLift, rose extract, ceramides. Aqua, Soluble Collagen, Hydrolyzed Elastin, Caprylic/Capric Triglyceride, Isopropyl Myristate, Propylene Glycol, Rosa Canina Extract, Stearic Acid, Polysorbate, Cetearyl Acohol, Oryza Stiva (Rice)Germ Oil, Butylene Glycol,Saccharomyces/Calcium Ferment, Cydomethicone, Milk Lipids/Ceramide 3, Glycerin, Dimethicone, Glyceryl Stearate, Cetyl Alcohol, Inulin, Sodium Hyaluronate, Butyrospermum Parkii, Parfum, Dmdm Hydantoin/ Methylchlorosothiazlinone/Methylisothiazolinone, Acrylates /C10-C30 Alkyl Acrylate Crosspolymer, Disodium Edta, Sodium Hydroxide, Peg-8 Tocopherol/ Ascorbyl,Palmitate/ Ascorbic Acid/ Citric Acid.